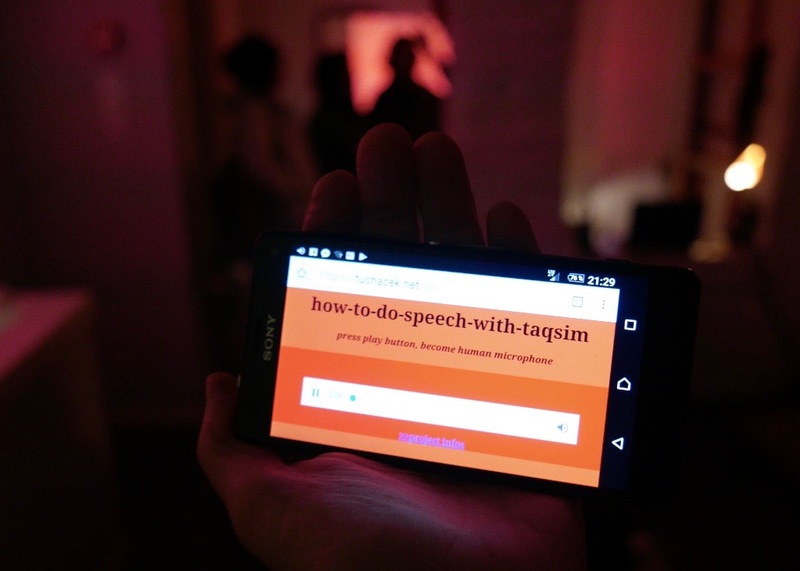 The performance “how-to-do-speech-with-taqsim” adresses the current power relations of speech positions, which we are experiencing recently worldwide in the polarization of communities, prejudices, origin, ideologies and ethics. “taqsim” as a form of musical improvisation, that usually precedes the performance of a traditional Arabic, Greek, Middle Eastern, or Turkish musical composition. 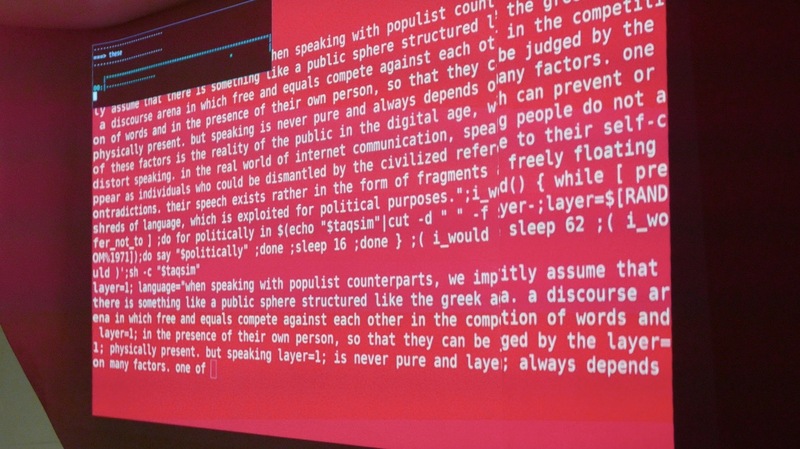 The artist will therefore perform a software code, which consists of parts of a text concerning the topic of how to speak (in a political sense) in digital networked enviroments. 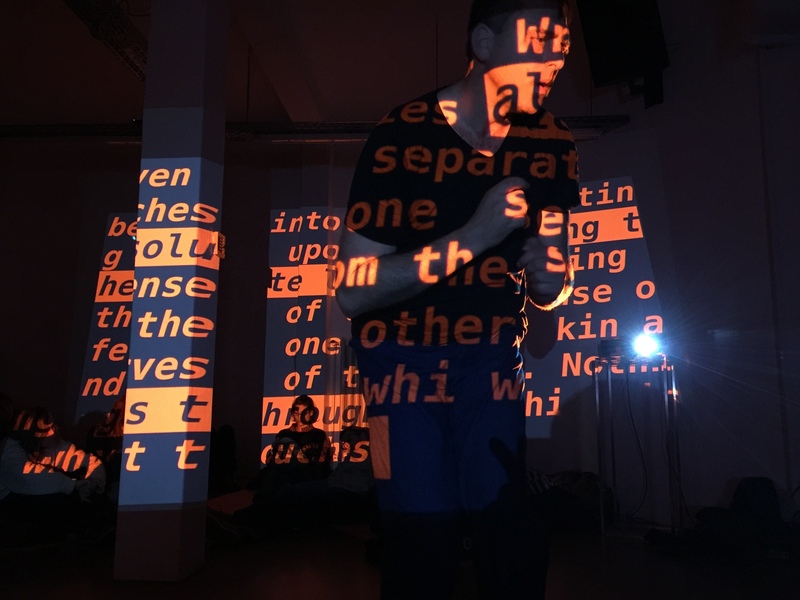 During the performance, the artist will stretch, loop and distort text fragments and passages from a popular Turkish music piece. 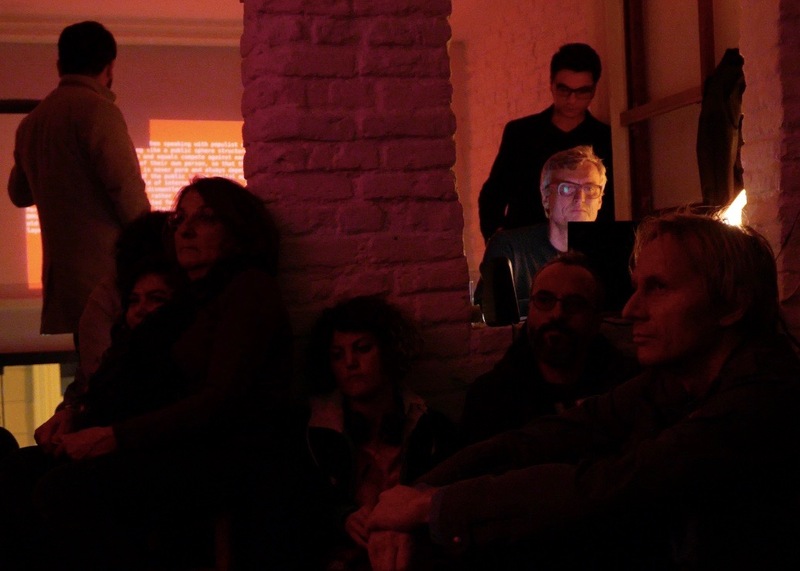 Within the performance the audience will also be invited to become part of a mediated ephemeral space, a sort of becoming a collective voice through their Smartphones. The work is about questions of participation and felt powerlessness due to the increasing algorithmization of our realities of life. As Luciana Parisi describes it with the concept of algorithmic environments, the work tries to escape the dichotomies of cultural nature, man-machine and tries to oppose a third figure, a figure of transformation and hybridization. 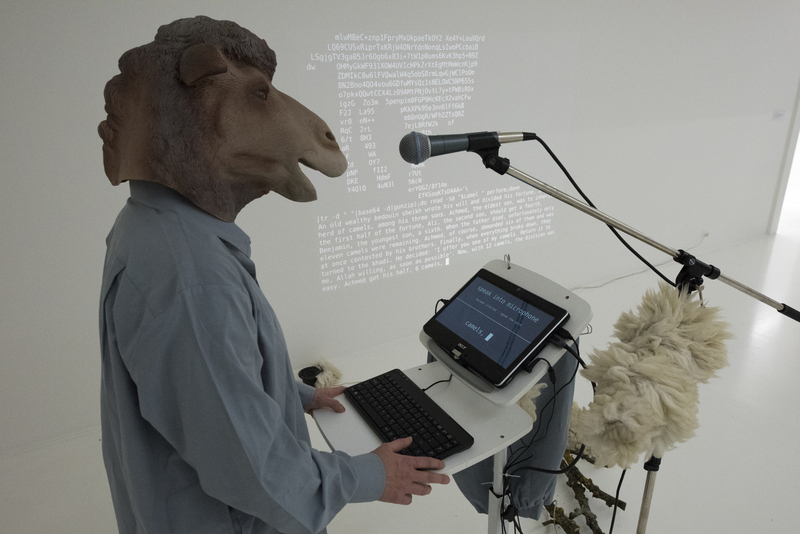 The work refers on cultural-historical references to human-animal hybridisations and transfers this transformation to the relationship to the algorithmic and tries to narrate it further. the format of presentation is a programmed communication system, a speech bot, which tries to involve the visitor in a conversation and create a transformed relationship through speech and speaking. Visitors are asked to choose their own mobile phone number and will then be connected to an algorithmic speech bot. Every conversation between visitors and the bot is stored in an archive and will be used to improve the vocabulary of the bot (as known from commercial customer conversations). Every visitor can decide whether to talk to the bot or to listen to prerecorded conversations from the archive. 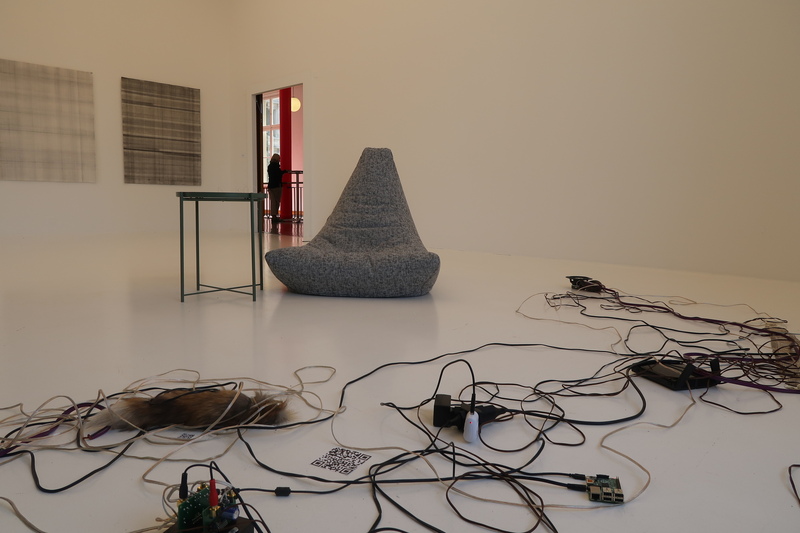 The installation consists of a comfortable beanbag and a prepared smartphone placed in the midst of a hybrid mixture of cables and electronic accessories as well as animal objects (a fox tail, a snake skin, chicken feathers, a sheep’s horn and a peacock feather). A fir-green wall stands for the artificial in our understanding of nature..
«unfolding agency: stategies of exscription #1» ist eine performative Aufführung in 5 Szenen, bei der es um das Verhältnis von Körper und Schrift geht. Ein Verhältnis, das im Zeitalter digitaler Medien ein strittiger Raum ist. Digitale Medien greifen immer stärker und unsichtbar in unser Leben ein – und das mit dem Versprechen auf Freiheit und Selbstbestim-mung und der impliziten Hoffnung auf das Delegieren von Mitbestimmung in den entkörperten Cyberspace. 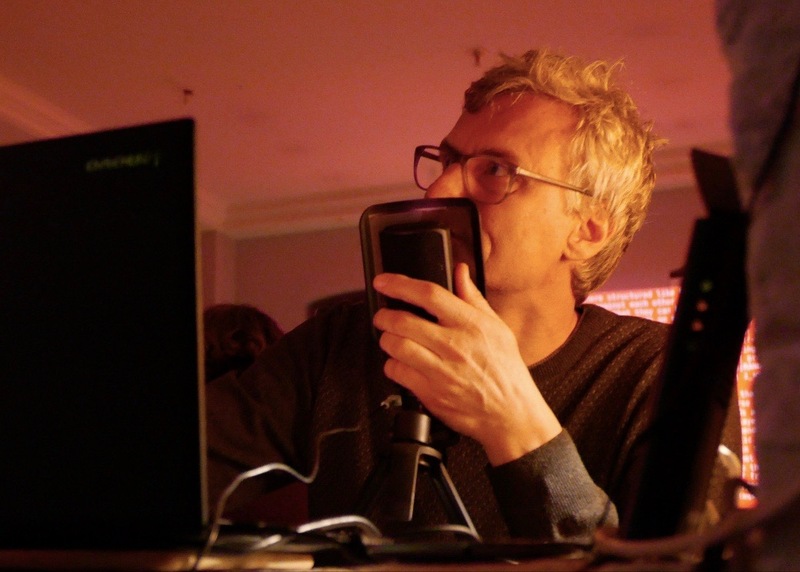 Die Arbeit geht von einer Textstelle von Jean-Luc Nancys Buch «Corpus» aus. 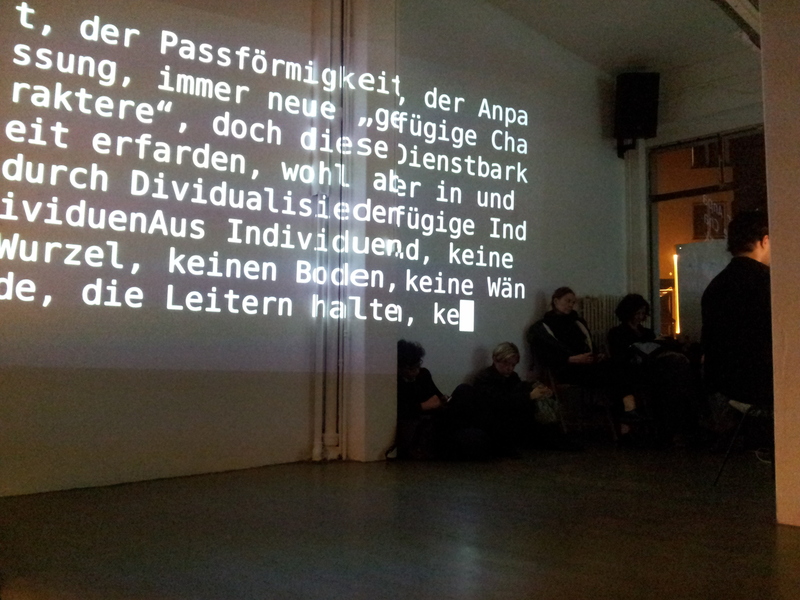 Dieser Text wurde als Soundfile eingesprochen und kommt in dem Stück «unfolding agency: stategies of exscription #1» zur Neuaufführung. 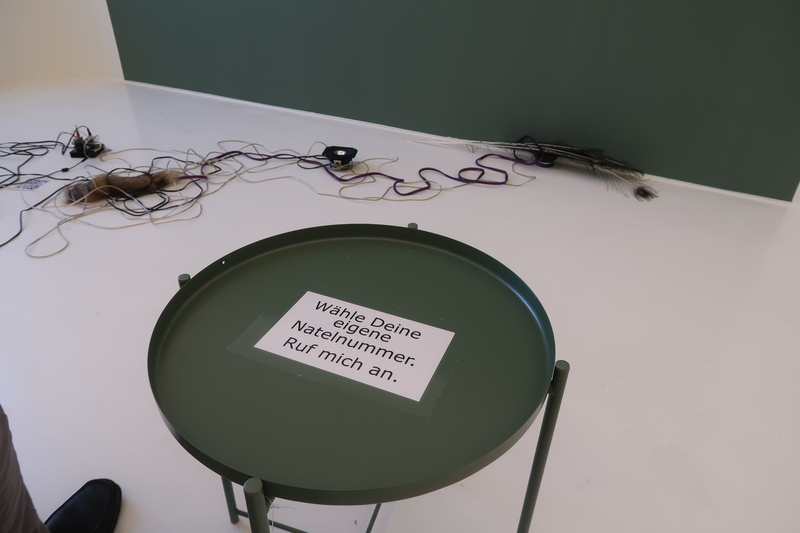 Ein Butoh-Tänzer steht mittig im Raum und steuert durch minimale körperliche Bewegungen eine maschinische Wiederaufführung der Audioaufnahme des Nancy-Textes, indem er über einen Bewegungssensor “ein-ge-lesen” wird. Ein maschinischer Textschreiber versucht, Laut für Laut dem körperlichen “Sprechen” zu folgen, so dass eine musikalische Komposition aus Zerrungen, Pausen, Lautverschiebungen und Stimmvariationen ensteht. Die geschriebenen Textzeichen überschreiben die Wände des verdunkelten und durch Scheinwerfer akzentuierten Raumes sowie den Tänzer/Performer und werden wiederum zur Quelle des Ein-Lesens durch eine Kamera. In der Aufführung geht es um den unsichtbaren, nicht-sprachlichen Zwischenraum zwischen Schreiben und Geschrieben-werden. 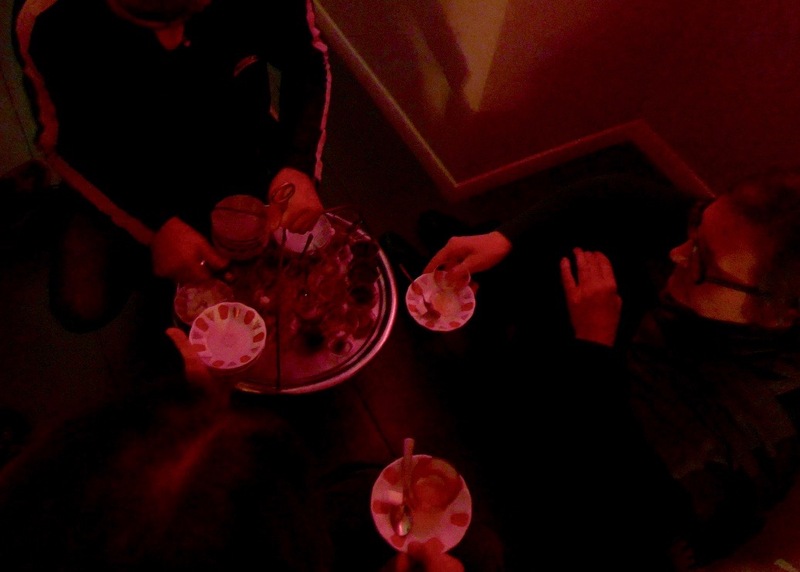 Book launch with Gerald Raunig, with performative readings and interventions by Niki Kubaczek, Isabell Lorey and Alexander Tuchacek. Please bring a fm-receiver with you if you have one of these! In this way you support the interventions and can actively participate yourself! 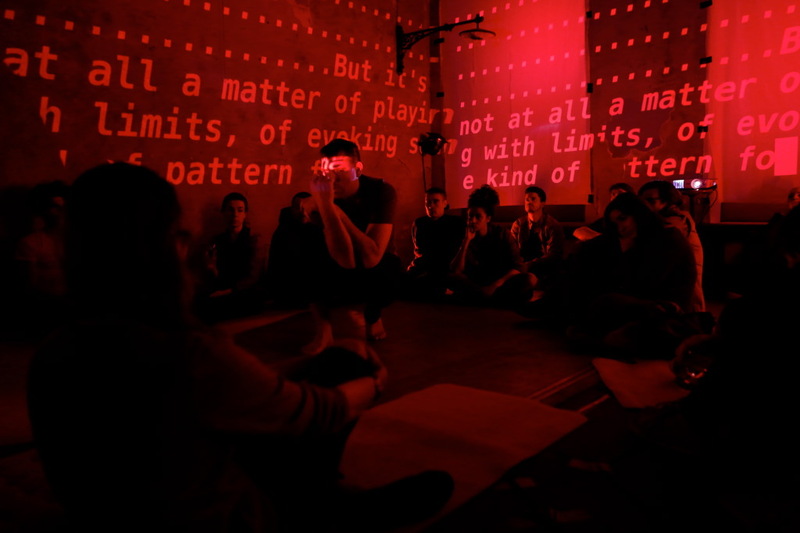 A human voice reads a short sections of Nancys Text “Corpus”. 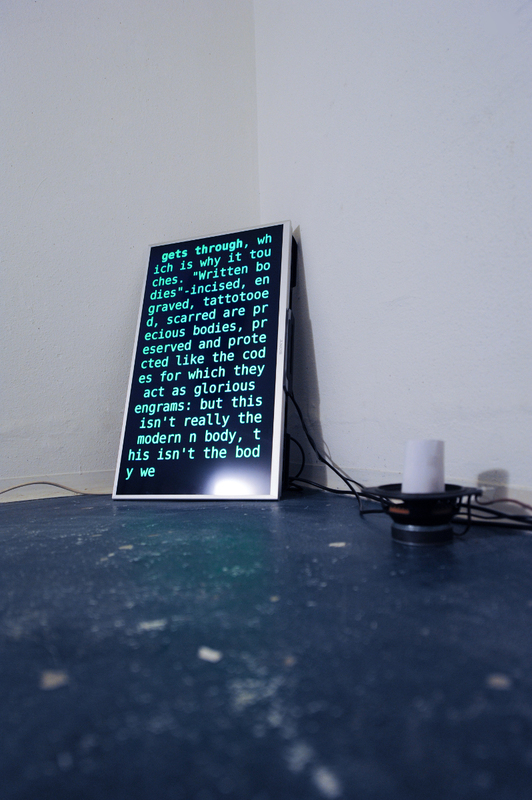 The Voice follows the text, automatically written in a Unix Shell Termial. The Voice stutters, hissis, hangs, sings and freezes. Sometimes it seems that the writing programm follows the speaker, somtimes it’s the other way round. 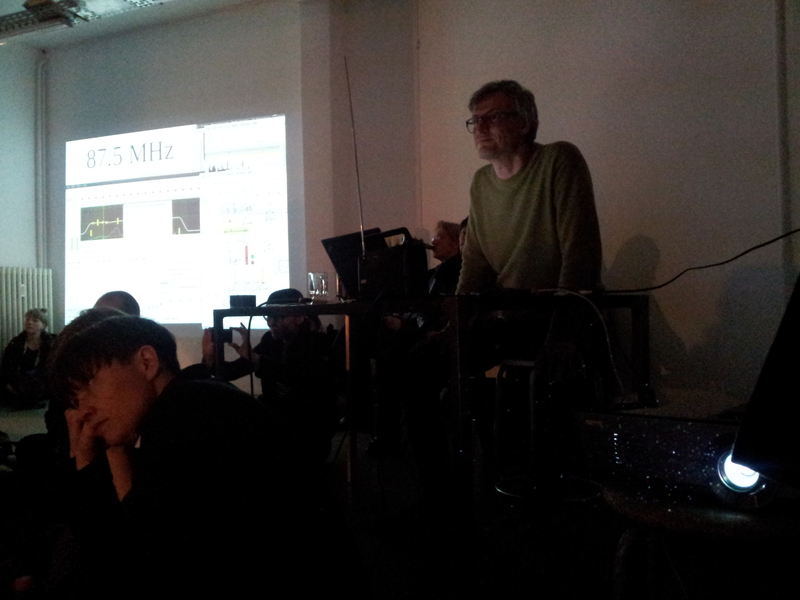 Text, sound and technical objects in the space are part of the selfexecutable programm of “exscription”. chmod +x is the Unix command that make it possible to change text into runnable code. Promises of self-empowerment and participation are integral to digital media. It is not only since Edward Snowden’s disclosures that sharing has presented itself as something ambivalent: social networks have created the potential for democratic public opinion and at the same time greater surveillance. This space between sharing and being shared, in which the private is only generated through the public, is the focus of the workshop. 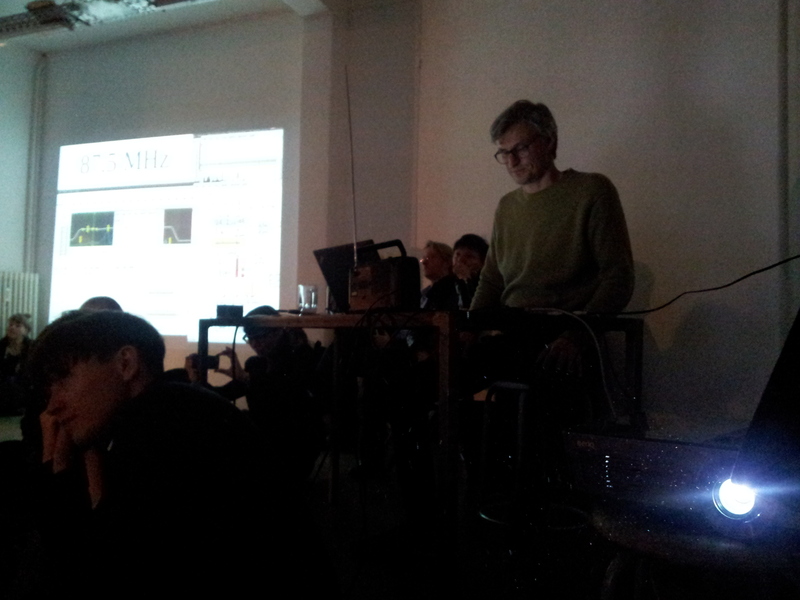 Alexander Tuchaček, co-founder of media group Knowbotic Research, proposes a media communication structure in which decentralised forms of participation and withdrawal are tried out. In terms of discourse and performance, it is all or nothing: who shares with whom? Who decides the rules about how, when and what is shared? Are there scripts for the uncoded? Can sharing lead to involvement or participation? Who writes the guidelines? 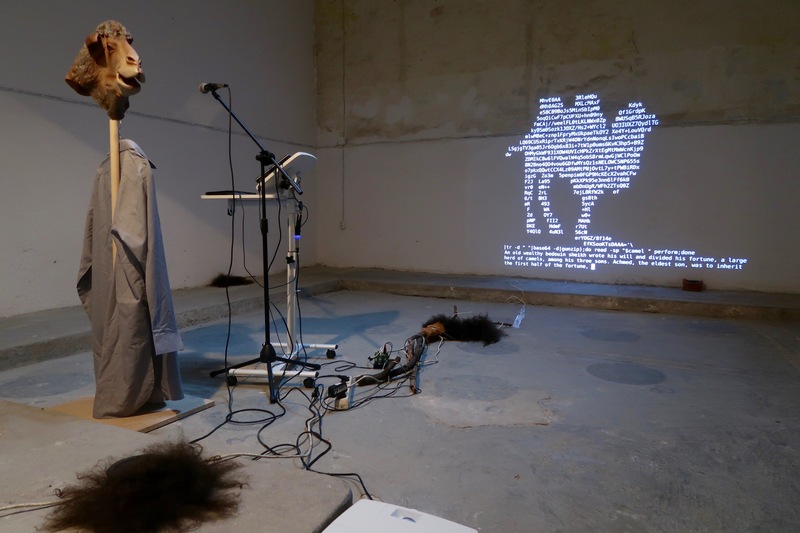 The twelfth camel is all at once, an image, a text and a program. The twelfth camel is a figure of thought, which oscillates between character, code and physicality. If you move closer, you notice readable ASCII characters that are part of a computer program, if you you go further away, you can see the picture of a camel. This camel is a special animal, a “performance” camel, it can run (as a program) and tell a story. The story is about the twelfth camel, that in some ways was necessary to help to devide the fortune under the three sons of the sheike when he died, but even it also was not necessary, as they afterwards returned it healthy and well fed to the Khadi. 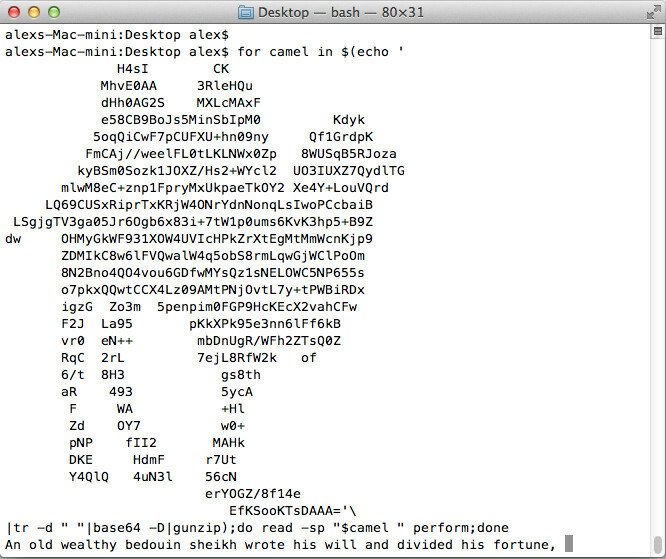 the ascii image executes itselfe as unix shell code. While executing it decrypts itselfe (base64, gunzip) in a loop (for-done) and tells (echo) the story of the 12. camel word by word (read). I owe the story Niklas Luhmann (Die Rückgabe des Zwölften Kamels: Niklas Luhmann in der Diskussion über Gerechtigkeit ). Was the 12-camel needed and why was it necessary? If it was necessary to divide, was it afterwards no longer necessary? Does there have to be supplied a real camel and must it be fed and how does the 12th differ from the other eleven camels? What does the “telling” of the story? What are the consequences that these things that can “Kamelogramm”, the behavior, the coding hardly be returned?